November 6-10, 2017 is National Distance Learning Week (NDLW). In association with NDLW, the United States Distance Learning Association (USDLA) is offering free webinars on a variety of topics related to online teaching and learning. A few other organizations are offering free webinars during NDLW as well. For more information on the activities and to register for the webinars visit NDLW 2017. November 7-11, 2016 is National Distance Learning Week (NDLW). In association with NDLW, the United States Distance Learning Association (USDLA) is offering free webinars on a variety of topics related to online teaching and learning. A few other organizations are offering free webinars during NDLW as well. For more information on the activities and to register for the webinars visit NDLW 2016. Self-directed learning is especially important for student success in online classes. Educators have an important role to play in assisting students to acquire the skills for self-directed learning. So how can educators help students develop their ability to direct their own learning, while ensuring that they develop the skills and integrate the knowledge they need to be successful? If you are interested in getting more information you should read Dr. Munro’s blog post, But how do I help learners be self-directed? Many students enroll in online classes because of the convenience and flexibility. Some students mistakenly believe taking an online course is going to be easier than a face-to-face class. It is important that students understand online courses require greater responsibility/ownership for their own learning. Following these strategies and techniques can help students to succeed in online courses. If this has piqued your interest, you can read more in the Ensuring Student Success in Online Courses article. Engaging students in eLearning can be more challenging than in a face-to-face class. 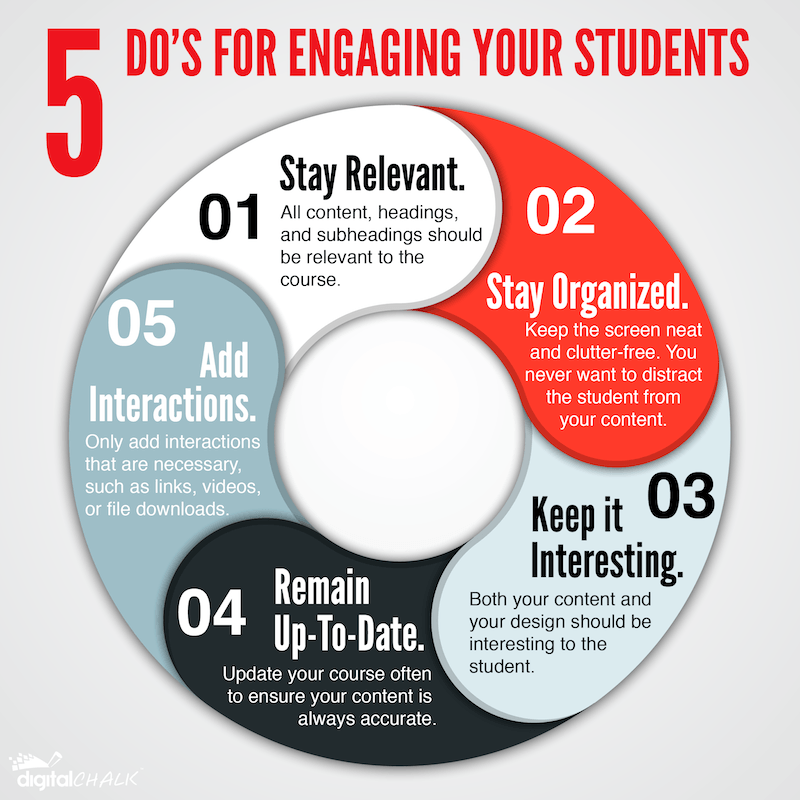 Follow the 5 do's presented in the Engaging Students in eLearning Infographic to create an engaging online course for your students. Stay Relevant - All content, heading, and subheading should be relevant to the course. Stay Organized - Keep the screen neat and clutter-free. You never want to distract the student from your content. Keep it Interesting - Both your content and your design should be interesting to the student. Remain Up-To-Date - Update your course often to ensure your content is always accurate. Add Interactions - Only add interactions that are necessary, such as links, videos, or file downloads. A conversation with Dr. Robert Crow of Western Carolina University (WCU) on teaching, learning, and distance education. Robert Crow, Ph. D., is an assistant professor of educational research. Before joining the faculty in the College of Education and Allied Professions, Dr. Crow served as Coordinator of Instructional Development & Assessment for WCU's Coulter Faculty Commons, working primarily in faculty professional development. Dr. Crow's expertise in assessment and evaluation has led to collaborations with other 4-year institutions, community colleges, PK-12 schools, and institutional accreditation agencies such as SACS-COC. Dr. Crow's research interests include assessment and evaluation of student learning and of learning environments. ...continue reading "Conversation #43: Robert Crow on Distance Education"
Feedback - invite students to share their comments about the content. Polling - asking polling questions can initiate discussion. Scavenger Hunt - send students on a virtual scavenger hunt to find something and come back with their findings to share with the class. Graphics - use graphics to create visuals. Students could be allowed to use electronic whiteboard tools to mark up the graphics or identify parts of an image. Multimedia - use video and/or music clips to add something for your visual and auditory learners. Polling - give students a chance to think about the content that was covered and apply it. Electronic Whiteboard - get students involved by asking them to write on the electronic whiteboard. Discussion - assign a topic and have the groups discuss and report back to the class. Brainstorming - allow the class to break into groups to brainstorm ideas. Project - allow time for groups to work on a group project together. Case Studies - allow your students to practice their problem-solving skills. Role-play - similar to case study; give students a scenario they must work through where each group member must take on a role. Use authentic materials - use real materials that give students an inside look, for example, online museum exhibits, scientific simulations, and scanned manuscripts. Give students the opportunity to facilitate an activity. Appoint a note taker for each session. Appoint a student to lead the discussion.